← Neo-Nazis Model Their Uniform On Trump’s Golf Gear…..
As is well known by now, the neo-Nazis and white supremacists who turned up to Charlottesville last weekend included large numbers of armed militia members, equipped with modern automatic rifles which they were apparently ready to use (see photo below). 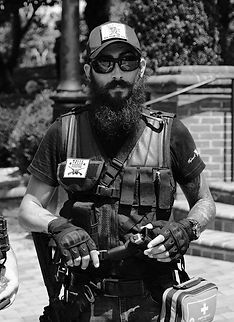 Less well known is that the anti-fascist, or ‘antifa’ opposition also had armed supporters deployed in Charlottesville. A left-wing group known as ‘Redneck Revolt’ intervened to protect anti-racist protesters at several points and also came to the rescue of the radical African-American cleric and academic, Dr Cornel West and his colleagues when they came under attack by white supremacists. The group has a website which can be found here; its statement of principles includes a belief ‘in the right of militant resistance’. I’d bet the mortgage that Attorney-General Jeff Sessions already has the group in his sights. What better way to vindicate Trump’s ‘both sides’ assertions than to target ‘Redneck Revolt’ along with the neo-Nazis. The situation on the ground in Charlottesville, Virginia, is still developing and unstable, but a few of our Redneck Revolt members on the ground took some time to provide the following report back. We will continue to share updates as they’re available. 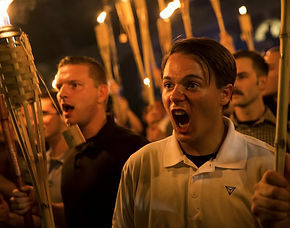 For those who are still unaware, this weekend has been the largest convergence of far-right and white nationalist/white supremacist organizations in recent US history. They have descended on Charlottesville, a town of approximately 48,000 people, as a response to the planned removal of a statue commemorating Confederate General Robert E. Lee. Earlier this year, self-described White Nationalist Richard Spencer led a torchlit march on the statue, with the intention of terrorizing locals who support the statue’s removal, particularly people of color. This weekend, the stakes were raised at an event called “Unite the Right,” organized to tie together white supremacist groups across the spectrum. Participating groups and white supremacist personalities included Richard Spencer, Matthew Heimbach of the Traditionalist Worker’s Party, Baked Alaska, Based Stickman, Augustus Invictus, Mike Enoch, Proud Boys, the Ku Klux Klan, and Nazi groups. Locals and members of surrounding communities gathered in Charlottesville to take a stand against the “Unite the Right” rally, and defend their town from white supremacist organizing. Five Redneck Revolt branches from nearby towns have been on the ground in Charlottesville since yesterday, and working closely with the SRA, BLM, and local organizers to develop plans to protect the local community. Last night, Dr. Cornel West and several local faith leaders called for a prayer meeting at the St. Paul’s Memorial Church in Charlottesville. Armed Redneck Revolt members were on-hand to assist with security, when word was received that the 300+ white supremacists were marching with torches across the University of Virginia campus towards the church. Across the street from the church, the fascist march encountered several anti-fascist and student counter-protestors, and a skirmish erupted. Redneck Revolt members assisted with escorting folks from the church to their cars, and everyone was evacuated safely. 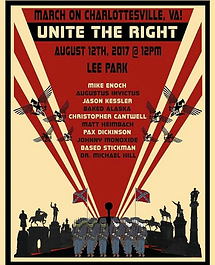 Today, with hundreds more white supremacists expected to converge on Charlottesville, our Redneck Revolt branches worked together with local organizers to create and secure a staging area at Justice Park, within a short distance of the planned Unite the Right rally location, Emancipation Park (formerly Lee Park). Approximately 20 Redneck Revolt members created a security perimeter around the park, most of them open-carrying tactical rifles. 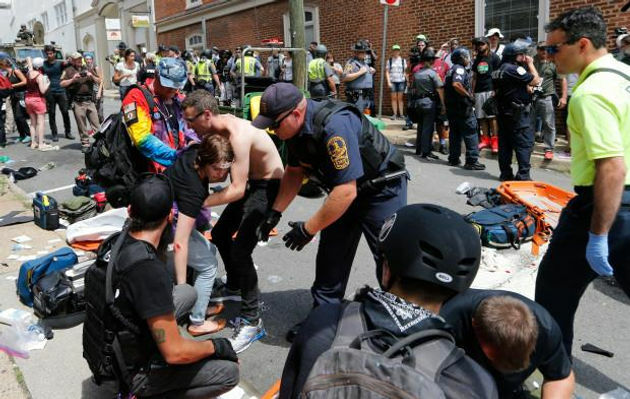 Starting from early in the morning, there were eruptions of violence scattered throughout downtown Charlottesville, and around 11:30am, the governor of Virginia declared a state of emergency and ordered the police to cancel and evacuate the “Unite the Right” rally. National Guard and local police forces worked to contain the scattered violence, with little impact. Throughout the day, the staging area at Justice Park was a safe haven for a wide range of protesters and other community members. Support teams provided food, water, medical support, and sanctuary, and groups such as the Quakers, Black Lives Matter, antifa groups, queer radical orgs, and the IWW moved in and out of Justice Park as needed to regroup and take care of each others’ injuries. At many points during the day, groups of white supremacists approached Justice Park, but at each instance, Redneck Revolt members formed a unified skirmish line against them, and the white supremacists backed down. Most of the groups were not easily identified, but at separate points, contingents from Identity Europa and the Proud Boys were recognized. The groups that threatened the park yelled racial and homophobic slurs, and many yelled things specifically at the Redneck Revolt fire teams which indicated that they were familiar with our principles. Some of the groups that approached numbered as many as 40 people, but the security of Justice Park was never breached. The worst moment of an entire weekend of white supremacist violence came when someone rammed their Dodge Charger into a large crowd of anti-racist protesters. A 32 year old woman was killed, and at least 19 others have been reported injured. 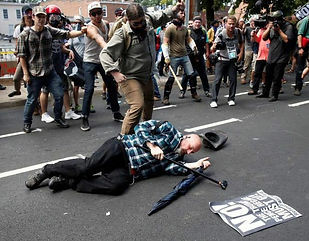 The crash and screams were heard by the groups staged at Justice Park, and two Redneck Revolt members ran down the street and assisted in direct medical support. 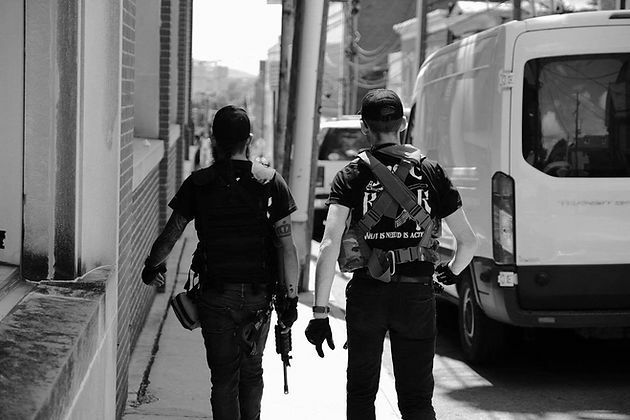 There are ongoing security actions planned throughout the night, to protect groups or locations which are at a higher risk of being attacked by the fascists, and our Redneck Revolt members on the ground will continue to check in as they are able to. They are especially appreciative of the camaraderie of the SRA, and look forward to building stronger defense networks together. For folks looking for ways to provide support, there are several fundraisers circulating for legal and medical funds for the anti-racist protesters. We have not been able to independently verify these funds yet, so we appreciate any locals who can vouch for them. These fundraisers have been shared on our national Facebook page, and we will add them to this reportback as they’re verified. If you’re in Charlottesville, please connect with other community members and form plans to keep each other safe. Folks who feel at risk are encouraged to stay together in groups, and check in on community members regularly who may be more isolated. 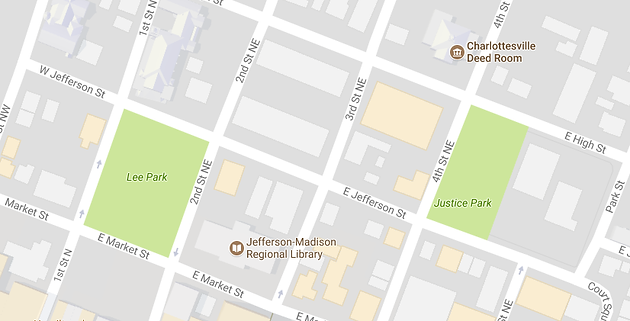 Take precautions if you’re going to be downtown, and be aware that there are still reports of groups of fascists wandering around looking to inflict violence. We recommend being armed if you are able to be. There are many accessible less-than-lethal options which can help out considerably in a self-defense situation, such as mace. Take the time to eat, drink water, and rest. Solidarity! Astonishing. Heavily armed groups of men facing off in the streets while the state police ‘tip the wink’ to outright fascists as they go about their business of spreading terror to the black community.